Sew Inspired: look what I just made! I cut 6.5" squares when I could, and the fabric that was not big enough for squares, I cut into rectangles that were 6.5" on 2 sides so I could still use them in the rows between the squares. Something happened with my planned/random look while I was sewing the rows together and I don't think it looks quite right between rows 3 and 4 but, oh well, it'll do. Sometimes it's really satisfying to make up a quick project that hasn't been planned out for weeks or months. I think its great. 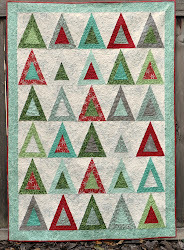 I have a ton of 6.5 squares sitting here, but I have no clue how to make the quilt! Gonna search your blog for some tips! Thansk for the great blog!